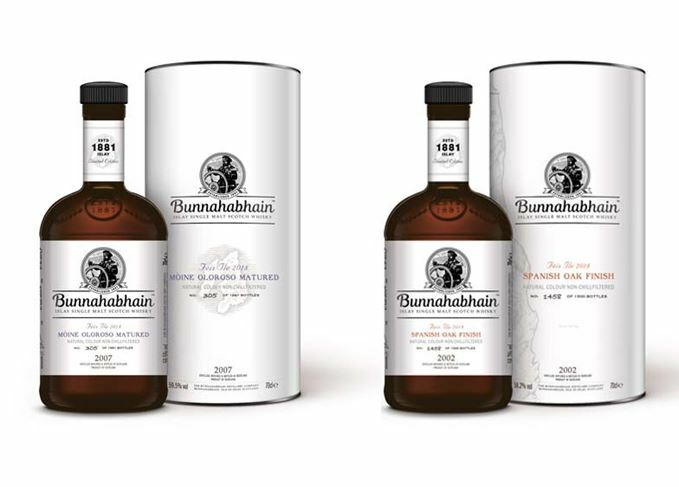 Islay distillery Bunnahabhain has released details of its annual Fèis Ìle bottlings: a no-age-statement Sherry cask-finished peated whisky, and a 15-year-old Spanish oak-finished malt. The two bottlings will be released as part of the distillery’s celebrations for Fèis Ìle (Islay Festival), which takes place on the island from 25 May to 2 June. Bunnahabhain Mòine Oloroso Finish was distilled in 2007 and is bottled at a cask strength of 59.5% abv. Mòine being the distillery’s peated line of whiskies, the bottling is said to contain notes of ‘spicy, smoky peatiness’ on the nose and ‘fig and raisin, honeyed nuts, pepper and wood smoke’ on the palate. Derek Scott, brand director for malt whisky at Distell, which owns Bunnahabhain distillery, said: ‘If you translate the words “Mòine Oloroso” from the Gaelic and Spanish it means “scented peat”. Bunnahabhain Spanish Oak Finish is a 15-year-old single malt bottled at a cask strength of 58.2% abv. The whisky has been aged in refill American oak casks before being transferred to Spanish oak Gran Reserva barrels in 2013. ‘This final stage in its maturation has created an intense aroma of ripe berries and spices, leaving a dark chocolate and light spiced flavour on tasting,’ said Scott. A total of 1,881 bottles of the Mòine Oloroso Finish (£95) and 1,458 bottles of the Spanish Oak Finish (£250) have been produced. They will only be able to purchase from Bunnahabhain’s visitor centre from its festival open day on 1 June. Bunnahabhain’s Fèis Ìle celebrations also include production tours, tastings and – new for this year – a 30-minute boat ride to view the distillery from the sea. The Islay distillery is giving whisky enthusiasts the chance to visit the 2016 Feis Ile for the day.